How Did Leonardo Da Vinci Achieve Greatness? Leonardo was certainly a genius. And how does a genius achieve so much? Are there geniuses who achieved little? Of course there are! 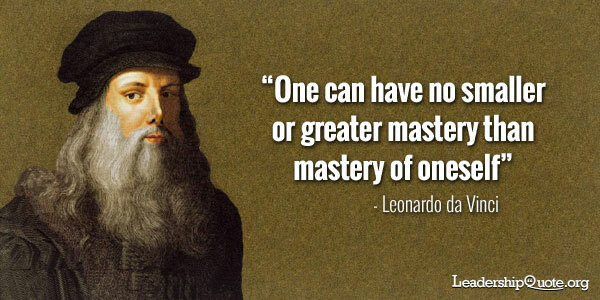 There is a strong hint at Leonardo’s secret in the quotation above. You have this great new idea or that great new project and it will move you significantly towards your goals which are in line with your main purpose in life. After being highly self-motivated in the beginning, you have to find a way to stay motivated through the difficult times but always occur in any project. The danger will be in starting with enthusiasm and then allowing priorities to drift, which can mean that deadlines will be missed, with all the attendant difficulties of broken promises to others – or even to yourself. Self-discipline and self-management are the essence of hard work. Many quotes about leadership can tell you that, and with good reason. You will find many of the great leaders of history giving you that advice couched in many different words and ways. I always find it amazing to reflect that these things have changed little over the centuries. When I discuss that famous phrase “time management” during my mentoring of business leaders, it very quickly becomes clear that there is, in reality, no such thing as time management. We quickly conclude that “self-management” is a better definition. Take a look at the leaders in their field, the really successful entrepreneurs or sport players for example. Many people will see the image of a graceful swan, gliding along on the water. What the observer will not know is the amount of furious paddling going on under the surface. You will probably have heard one of the many versions of the famous answer given by a world champion sports player to a call from the crowd at a great sporting occasion. The player accomplishes an astonishing sporting feat before many thousands of pairs of eyes: “What a bit of luck!” calls a spectator. The world famous player turns and replies “You know what? The more I practise, the luckier I get”. Gary Player, the great golfer, is often quoted as saying it and then again, so it Tiger Woods. The reason this is attributed to so many of the greats is almost certainly because so many of them have actually said it! We have to acknowledge that we simply don’t become that great at anything unless we work hard at it, tirelessly over a significant time period. There are plenty of ways of keeping yourself motivated. I discuss many of these in my self-management workshops. One of the ways is to use inspiring stories and quotations! Use the quotation above to imagine that Leonardo da Vinci is speaking to you personally and helping you to be inspired to continue with your project. Find a hero who is relevant to your specific project and use them to inspire you. Find a relevant story and read it. Google your goal and read success stories. You will soon find that you can relate to some of the challenges and the ways that successful people have surmounted them. When you have found your own special way, you will be moving in the direction of the self-mastery to which Leonardo referred. You will find yourself building the habit of self-mastery which will stand you in good stead in your career and your life. If you enjoyed reading this post and would like more inspiration, my FREE Quote of the Week newsletter delivers weekly insights and inspiration and great quotes about leadership to your inbox – simply fill in your details below. Do You Have Permission to Think? I don’t know about you, but I always have enough on my list to keep me busy for several months ahead. This has been the case from the moment I had a job after I left university. The idea of a to-do list which is “complete” is not something that most modern managers or leaders or the self-employed can really imagine. This presents another major issue for us all. When we have enough “busy” work to do, and especially when we may be judged by others who are sitting and watching us, there is a temptation always to keep producing visible “output”. Also, with such a big to-do list, it is very easy to slip into a reactive state and always fill our days with busy-ness. There is a culture in many places and in many companies which precludes sitting quietly and thinking. The result of this pressure, which comes from either outside or inside, is that we just don’t take the time to plan our thinking or to do it. We don’t believe we have permission. This means that we can easily miss the important issues and opportunities because we are too busy with the less important but more urgent things which are thrown at us. Can you put a value on a missed opportunity? No, neither can I but I know it’s not negligible. Let’s talk more about what this quote on leadership means to us. If you don’t already routinely add a slot in your diary for “thinking time”, I strongly recommend that you try it. I take an hour a week on a Monday morning to stand back. I recommend you do the same. It doesn’t have to be on a Monday morning. It’s a good time though. Everybody else is rushing around. You are fresh and you can take a perspective view. Make an appointment with yourself, take a pen and notebook (remember them?) and sit quietly with your mobile phone on silent or switched off and with your computer in another place entirely. I suggest that you pick an important topic which is relevant to you, your life, your business, your career. I find it helpful to make notes during the week and stack up some ideas and things I want to consider. Once you start to do this and give yourself permission to take the time, you may find that one hour per week is not enough. You may well find that the return on your investment in time will be repaid many times over and that you decide to invest that little bit extra. Stack up your ideas during the previous week and you will find that your brain subconsciously works on these and will come up with ideas and suggestions which are completely new and often exciting. I use a small piece of software called Evernote (Google it) which helps me to gather together in one place all sorts of notes from my phone, my tablet and my computer and synchronises them all in one place. This helps my busy brain to remember things and best of all, to remember where they came from. Quotes on Leadership: How should you think? Most of our education does not involve being taught to think. There are many processes which I use. By far my favourite thinking teacher Edward de Bono. One of my favourite tools which I learned from him is “Alternatives, Possibilities, Choices” or APC. There is a lot of detail which it possible to learn about this but put simply, you consider the topic which you want to think about. You then draw up a list of all the alternatives, possibilities and choices which are available to you. Most of the thinking in our day-to-day life is to try and find solutions to problems. APC can be liberating when it is applied to something which is not a “problem”. If you sit back and consider this, you will start to realise that it is extremely potent to think about a subject which is a main theme or core of your activity but which is not necessarily considered to be a problem. It is well worth reading some of de Bono’s excellent books on thinking. If you have never considered thinking as a proper discipline which should be learnt, you are in for an interesting time! Most of us don’t have a helicopter but we need a helicopter view of our businesses and our lives. Taking that step back, taking an hour a week away from the busy-ness will reap rewards in the short and the long term. This is a little longer than my usual Quote of the Week but we have covered a lot of ground! It’s fairly obvious that we have only scraped the surface of some of the tools and techniques and therefore I expect to return to the topic of thinking in the future. This once again proves to me the incredible depth which is often hidden inside a quotation from a famous thought leader. 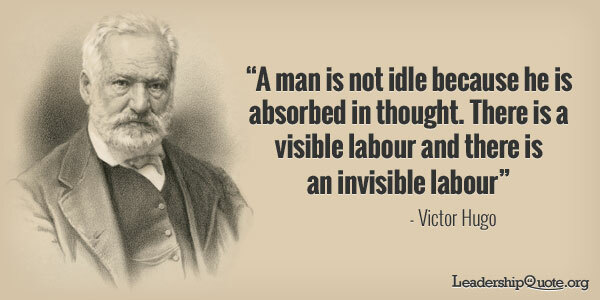 Victor Hugo made a good point! If you enjoyed reading this post and would like more inspiration, my FREE Quote of the Week newsletter delivers weekly insights and inspiration and great quotes on leadership to your inbox – simply fill in your details below. Will You Introduce a New Order of Things? As leaders, our job is to drive change. We must drive it in our businesses and we must drive it in ourselves. We know that if we are doing things the same way that we were doing them two years ago or even one year ago, we are not doing them very well. Management is about different things. Management is about systems and meeting targets. Management is about producing acceptable results within known constraints and conditions. Leadership introduces change. Therefore, don’t confuse management with leadership. I trust you find this as powerful as I do. Machiavelli was born nearly 600 years ago and I find it the more powerful for that. As the French say, “Plus ça change, plus c’est la même chose.” The more things change, the more they stay the same. For us in the 21st century, as leaders, we need to be aware that our task is change – what Machiavelli calls “a new order of things”. Never was this more true than now. We have all seen “lukewarm defenders” in those who would profit by the new order. We know that mankind does not “truly believe in anything new until they have had actual experience of it”. It is worth reflecting on the words of Machiavelli. Those of us who work in a corporate environment will easily relate to his very perceptive statement. How many times have we seen resistance to change? I would say every time, we see resistance, some strong and some very strong. Those who have an investment in the old order, those who even profit from it. Even those who can be considered “on-side” will resist change to a greater or lesser extent. So, how do we introduce change? How do we lead change? Be clear that a strong structure is necessary. We must decide where we want to go, encourage a committed bunch of influential people within the organisation that it is the right way to go. Then, we must make sure that the day and we communicate why we want to be. We need a broad commitment from the people within the organisation. We need to show them the reasons for wanting to be where we need to go and we need to show them the benefits, preferably by some short-term wins. We must push hard to make sure that the changes start to take proper root in the culture of the organisation. We must continually push again and again despite the setbacks which will come. Yes, I wrote it all in one paragraph! Believe me, that is a life’s work! Change is not easy. Plenty of famous leadership quotes phrase it in plenty of different versions. You know what? Once you are there, don’t sit down for long. You will need to be changing again very shortly! Motivation is the desire to do things. It’s the difference between staying in bed and getting up in the morning. It’s the crucial part of setting and achieving goals. You can influence your own motivation. In fact, I am strongly convinced that motivation can only come from within. If you are in a position to motivate others then I suggest you must come to terms with that. Accept that you can provide the conditions for the motivation of others and the leadership to help them find a way but ultimately, they must find the motivation in themselves. So, in my view, the very best way to provide those conditions for self-motivation is to respect people and trust them. As for motivating yourself, I have a few suggestions. There are plenty more where this came from and I’d really like to hear some from you. So, put a comment in the box below with your ideas. The first strong recommendation is to make sure your vision, purpose and goals are crystal clear. Unless you do this, how can you be motivated? I tell you now, if you don’t do it you will not be motivated. Work on changing your bad habits. Find those you don’t like and force yourself to think of different ways of doing things. Don’t expect to change everything at once but do expect to improve slowly step-by-step over a period of days, weeks and months. You will only do this if you identify what you need to do and how you can improve. Make a new habit of reading a motivational quote every morning (well, I would say that wouldn’t I?). But seriously, use the quote as a thought provoker. You don’t have to spend long on this in order for it to help. Think of the person who said it, think of what they did with their lives and what adversities they conquered. Use that to motivate yourself. That’s another quote on leadership we can discuss another time. Spend less time on Facebook or watching TV or doing any of those other things which, on reflection, you will see as a waste of your precious hours and minutes. Do the same things differently and do new things. “I am always doing things I can’t do, that’s how I get to do them.” – Pablo Picasso. Don’t expect to master them the first time but be sure to improve each time you do them. If you can’t find out how, find somebody who can. 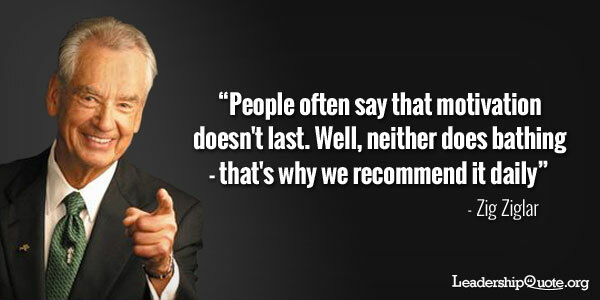 Be sure to remember what Zig Ziglar said about bathing and motivation. Don’t forget motivation needs refreshing regularly! So figure out what you want, push yourself through the pain and procrastination and start being who you want to be, living the life you want to live. Starting right now. Appreciates people, visionary, setting great examples, integrity, the great listener, enthusiastic, passionate, clear purpose, charisma, credible, patient, consistent, empowering, professional, trusting, great role model, builds teams, sympathetic, delegates, clear minded, firm but fair, inspiring. This is typical of the list of attributes given by many groups which I have asked over the years. Take note of the types of characteristics which are almost exclusively listed and which Admiral Burke also listed. All of them relate to the so-called “soft” characteristics of leadership – the human side. Some people disparage this type of characteristic, calling it “touchy-feely”. Dare I say that the leaders who disparage might possibly recognise that they have a certain weakness or tendency towards the harder side? Notice that the list given by the leaders excludes this harder side. Words such as “tough”, “angry”, “vindictive”, “short-tempered”, “stern”, “serious” are all missing from the list. In fact, they are rarely given after such a question. In my opinion these harder characteristics are the refuge for those who either cannot or do not have the strength to implement the human side of leadership in any consistent way. Having led some very large organisations and also having worked for some great bosses, in my opinion, these characteristics are to be looked up to rather looked down on. They are rarer and more difficult to achieve than the so-called hard characteristics such as “tough”, “controlling” or “ruthless”. I am also firmly of the opinion that people can learn to adjust their behaviour in order to become better leaders. I am an engineer and I like to measure things. I admit that it’s not easy to measure characteristics such as these. One thing is for sure, if you ask people right across your organisation, you will find that they come up with similar lists and very few will include the hard traits on their list. If you carry out such a survey, you will easily be able to measure how you and your organisation shape up. Now comes the difficult bit. How do you rate yourself as a leader, benchmarked against the characteristics and traits of a great leader which are given by nearly everybody who is asked? If you carried out an independent survey of the people who report to you, how would you rate? Would the traits from the soft list outweigh the ones from the hard list? And the big and searching question is “Would you be a more effective leader if you improved on any of the “soft” characteristics? What about the others in your organisation? What about your managers? 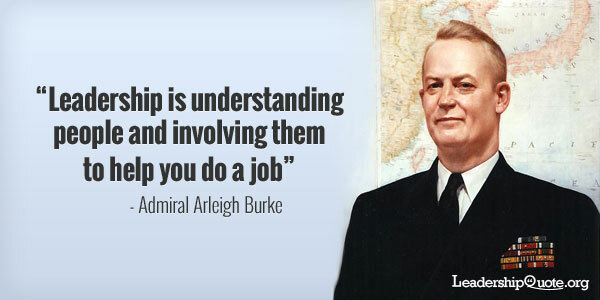 To what extent can you relate to this great leadership quote by Admiral Arleigh Burke? There is no getting away from it. People want and will follow leaders who are respectful, polite and have genuine empathy. They want leaders to show them the way, to walk with them when the path is difficult. Above all, they will follow leaders who have character and a strong vision! You may already be a really great leader, and there are doubtless many around. It’s still well worth auditing the leadership in your organisation. Imagine the difference that really effective leaders will make to an organisation!